A historic marker has been uncovered amid the grassy pedestrian path just east of the intersection of N. Meade St. and N. Marshall Dr. in Rosslyn. The age of the marker is evident in the rough stone mixture of the concrete. A single nail head on the top of the marker seems to have rusted blue, suggesting a copper or bronze nail. As the earliest identified location in what became Arlington County, Rosslyn is filled with history. The marker is about a half-mile from the Custis-Lee Mansion, constructed in 1802 and still standing in Rosslyn under the name Arlington House. The marker is only about a quarter-mile from the historic Buffalo soldiers barracks. 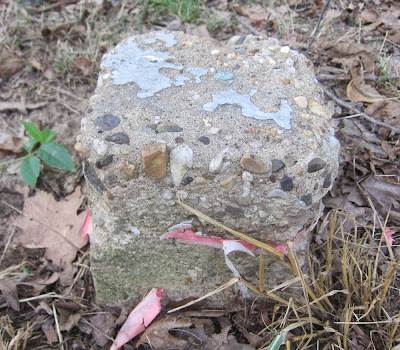 The Ode Street Journal's investigative reporter speculates that the marker indicates a boundary of the Rosslyn property that William Henry Ross purchased in 1860. Next time you want to enjoy a walk around historic Rosslyn, see if you can find this historic marker.